A reflection on one of the most important political speeches of the year. Last night, the annual Presidential State of the Union address was held in the House Chamber of the Capitol in Washington, D.C. As President Trump laid out his vision for the year and defended many of his controversial policies, I was watching and — like any good political wonk — judging! Going into last night’s speech, I had a pre-conceived notion of what the speech would be like. I knew it would be well written and convincing. President Trump has some amazing speechwriters who have spent months on the fine-tuning of his speech. With the help of the teleprompter, I knew that President Trump would seem more polished and presidential than usual. With this in mind, I began to watch the speech. In the moments leading up to the State of the Union, I watched my favorite part: seeing the Members of Congress interacting with each other. I find it is so interesting to watch how, despite partisan differences, they are generally quite friendly with each other. This was something that I saw first hand this summer while working in the Senate. Even if Senators were polar opposites on policy, they were still close friends with friendly interactions. While working in the United States Senate, I also had a chance to visit the House floor. One of the most surprising aspects of it to me was how small the House floor actually is. On TV it looks massive, but, in reality, it is very small, feeling just a bit bigger than our high school gym. I can’t imagine how packed and claustrophobic it must be during the State of the Union. “Madame Speaker, the President of the United States!” At that moment, as that announcer bellowed his introduction, I felt a sense of excitement thinking about how amazing it is that one of the most important people in Washington, the Speaker of the House, is a woman. Earlier in the day, I had seen an amazing clip from the first year that Nancy Pelosi was the Speaker, where President Bush took the time to address the glass ceiling that Pelosi had brought crashing down. In these few minutes, President Trump elicited bipartisan support as he mentioned two exciting anniversaries coming up this year. Regardless of party, we all can honor the work of those who fought on D-day and those who took us to the moon. I really feel that this exemplified how, even if we disagree on so much, there is still a lot in this country upon which we agree. Although it can be annoying, I do find the clapping to be interesting from a political perspective. It is interesting to see how certain politicians clap at certain times and sit stoically for other statements. I love the fact that so many women of the House wore white as a nod to the suffragette movement. As the female House Representatives sat together, the sea of white reminded all of us about the overwhelming power of women and the influx of new voices in this new Congress. President Trump mentioned that the United States is the #1 producer of natural gas and oil. We should not be proud of this. As a nation, we need to move away from fossil fuels. We have seen, even in the past few weeks, the dangers of climate change, which is only set to become worse over time. Although I do not believe in Alexandria Ocasio-Cortez’s “green new deal,” which is sadly untenable, I do feel that, as a nation, we must move towards increasing our reliance on sustainable energy methods. President Trump decried the investigations being undertaken against him in Congress. If one has done nothing wrong, then there is no reason to speak against or obstruct an investigation. President Trump bashed Democrats in the Senate for allegedly obstructing the confirmation of nominees. This is so ironic, given how Republicans in the Senate were unabashed obstructionists who did all they could to deny Barack Obama his nominees. The most prime example is, of course, Merrick Garland, who never even got a hearing to fill the vacancy of the late Justice Antonin Scalia. For President Trump to decry obstruction is almost comical, given his own party’s lengthy history of obstructing confirmations. The story of Alice Johnson is undoubtedly one of hope. Almost everyone can agree that Johnson’s life sentence was not right, given her change and the relatively minor nature of her crime. However, I do not like how President Trump spoke so much of himself at this moment. So many other people pushed for Johnson’s release. Everyone from her family, to her lawyers, to Kim Kardashian worked hard to free Johnson. For President Trump to take all the praise himself is not surprising but still not right. At this moment, President Trump spoke about how politicians and the wealthy live “behind gates and walls and guards” and said how regular Americans do not have this safety. This is a completely ridiculous comparison. A backyard fence is not the same as a wall. It does not require the ripping of land from private citizens or nature preserves. It does not plunge our nation further into debt. It does not go against everything that we are as a nation. A wall on our country’s entire southern border is not and will never be needed. The story of the elderly residents murdered by an illegal immigrant is undoubtedly a tragic story. However, the amount of murders committed by illegal immigrants is less than that of the crime committed by American citizens. The Cato Institute used similar data when it concluded that the incarceration rate for native-born Americans is 1.53 percent, compared to 0.85 percent for undocumented immigrants and 0.47 percent for legal immigrants. When Cato subtracted people in prison solely for immigration violations, the incarceration rate for undocumented immigrants fell to 0.5 percent. In one of my favorite moments of the night, as President Trump lauded himself for increasing female employment in the U.S., many of the newly-elected female Congresswomen began congratulating themselves. This was clearly a moment that annoyed the President, but, as a woman who hopes to go into politics, I felt that it was an amazing moment that highlighted the changing demographics of our Congress. President Trump mentioned how he would like to increase funding to fight HIV and AIDS. For me, this is so interesting, even just from a historical perspective. If one had said only a few short decades ago that a President would be discussing AIDS and HIV in such a national setting, it would have been unbelievable. Developments in both the medical field and in our acceptance of those with these conditions are truly remarkable. For a conservative President to mention Paid Family Leave was truly incredible. However, the poignancy of this moment was immediately tarnished by President Trump’s attack on abortion rights. Using medically unfounded terms and conjecture, President Trump decried New York’s recently passed Reproductive Health Act. His claim that the bill would allow for a baby to be “ripped from a mother’s womb moments from birth” is simply not true. 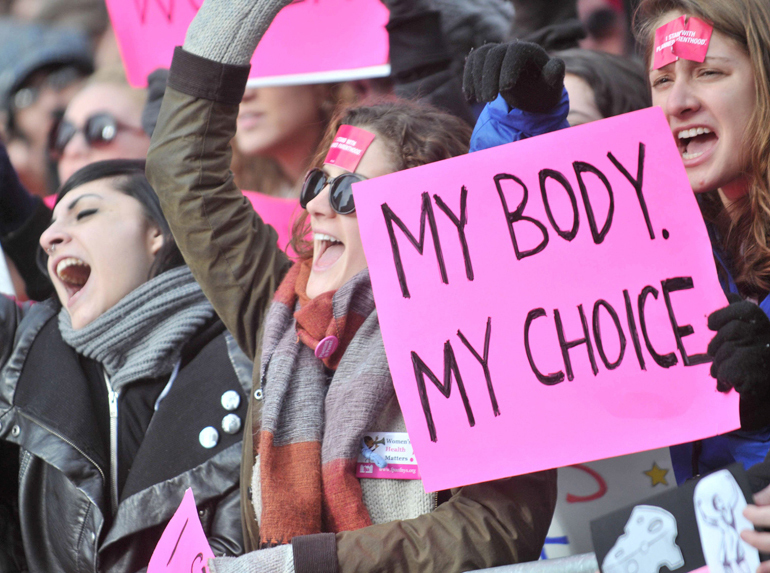 Under NY’s Reproductive Health Act, third-trimester abortions — after the 24th week of pregnancy — are only permitted if it is necessary to protect the mother’s life or health or if there is an “absence of fetal viability.” Nationwide, such late-term abortions are rare: About 1.3 percent of all abortions came after the 21st week of pregnancy, according to the CDC. The end of the speech was one of the most moving parts of the night. After decrying anti-semitism, President Trump introduced a survivor of the Holocaust and the soldier who was part of the group of Americans who freed the concentration camp where he was being held. This was an undoubtedly moving moment that touched on the power of America and the promise of our nation. My preconceived notions going into the speech were almost all met. It was a very good speech that presented a more polished version of the President than we usually see. Despite this, I feel that many of his words were simply empty promises, and I am doubtful that this speech will lead to any significant change.